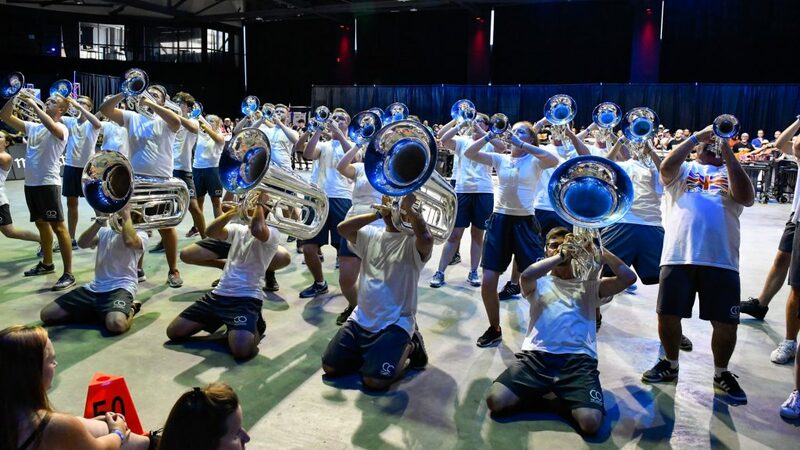 This August, the SoundSport International Music & Food Festival will return to downtown Indianapolis, offering a family-focused community gathering as part of Drum Corps International World Championships festivities. Building upon the wildly popular SoundSport® and DrumLine Battle™ events now in their sixth year, the event will feature more than 35 ensembles from the U.S., Canada and around the globe competing in downtown Indy the morning and afternoon of Saturday, August 11. The exciting day of performances will mark the culmination of the summer portion of the year-round performance opportunities for the global SoundSport and DrumLine Battle programs, all taking part in a festival-like atmosphere with some of Indianapolis’ best food vendors onsite and entertainment aplenty. Featuring ensembles of many types and participants of any age, SoundSport gives teams the opportunity to let their imaginations soar during five to seven minute performances with a special focus on entertaining the audience. All instruments are permitted so the audience may be treated to anything from a full marching band to a tin whistle ensemble at this eclectic musical showcase. Also featured will be percussive units from a wide variety of backgrounds vying for the championship title in the DrumLine Battle division. DrumLine Battle puts percussionists in the spotlight through thrilling head-to-head matches featuring their best two minutes of drumming, stick tricks, exciting visuals, acrobatic stunts, high adrenaline movement and a whole lot of attitude. This year’s festival return to the streets of Downtown and will spread out the action over three stages around Pan Am Plaza, located right in the heart of downtown Indy. DrumLine Battle teams will once again face off outdoors on Georgia Street and the Plaza, giving spectators the opportunity to be right in the middle of the action as they cheer on their favorite drum lines competing for the championship title. The SoundSport action will once again be housed inside the Pavilion at Pan Am. Once the home of the Indiana World Skating Academy, the facility has been completely renovated in recent years into a multipurpose indoor performance theater and event space. With stage lighting, video screens and 900-seat bleachers with 360-degree standing area views of the performance floor, this intimate venue is one of the most exciting stages we’ve used for SoundSport events around the world. The gourmet food truck scene has thrived in downtown Indianapolis in recent years. It’s no secret that Indianapolis has an incredible array of restaurants in a dense concentration that are easily accessible in the downtown area. And that restaurant scene has continued to grow and evolve with nearly 50 food trucks driving the streets of Indy offering an incredible assortment of gourmet street food from French fries to pizza, tacos, cupcakes and much more. The SoundSport International Music and Food Festival will bring together a festive sampling of those vendors to serve up a delicious assortment of light bites and delicious delectables, along with plenty of the Hoosier Hospitality that Indianapolis is known for. Admission to all performances as part of the family-friendly SoundSport International Music and Food festival will be free and open to the public on Saturday, August 11. Performance slots and vendor spaces are still available for 2018! Email perform@dci.org for additional information and to sign up today!